Young veteran-owned moving company leading the way in the Dallas, Fort Worth Texas furniture moving and relocation market by winning numerous awards. Voted top 2 moving companies in North Texas by Dallas A-List, and voted top mover by Best of Denton County. Not only is it a veteran-owned mover it also is a woman-owned company as well. During its first few years in business it has established itself as a leader in the moving service business by being the preferred mover for some of the best real estate organizations in the country. As the CarteBlancheMoving.com name implies it is more than just a moving company, it prides itself in being a customer service provider. Leading the moving companies it provides luxury move services, professional packing, move out cleaning, storage assistance, free on-site estimation for moving and other. Carte Blanche Moving performs residential moving, office moves, loading of PODS, moving labor, storage assistance and consultation. Being a military veteran-owned moving company they have always ensured they support military, veterans and first responders with support in terms of discounting their moves. Always striving to be the best moving company in Texas, Carte Blanche Moving has maintained 5 Star awards with Google and Facebook. Carte Blanche Moving services performs relocation for the Dallas Fort Worth metroplex and Texas market, including moving suburbs like Flower Mound moving, Southlake moving, Argyle moving, Highland Village moving, Lantana moving, Colleyville moving, Grapevine moving, Keller moving, Denton moving, Coppell moving, Carrollton moving, Lewisville moving, Frisco moving, Plano moving, down town Dallas moving, down town Fort Worth moving and many others. 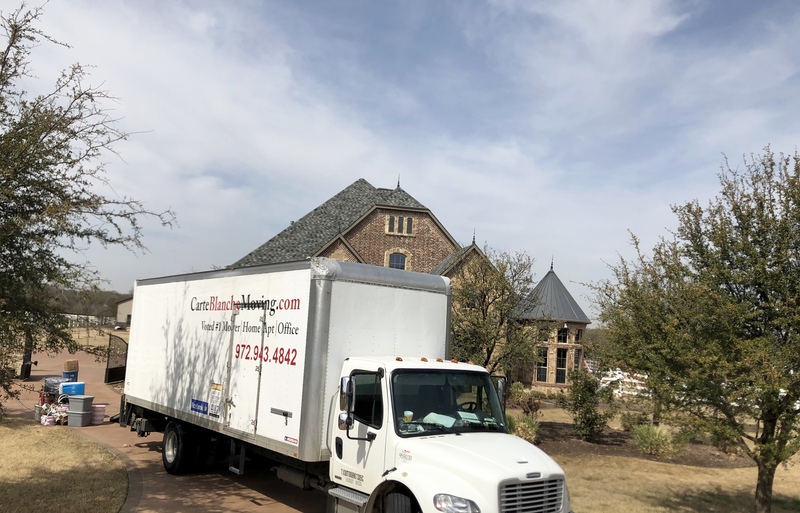 Carte Blanche Moving has not only hired the best movers in the industry but also compensates them for making sure they are diligent in protecting the client's belongings. That is why Carte Blanche Moving attributes maintaining the highest ratings and referral network for moving furniture.